Silversea Cruises launched the 596-guest Silver Muse in April 2017, and the luxury ship has eight passenger decks and many features that past Silversea guests and new cruise travelers will love. First, the almost-all inclusive ship has 411 crew members, so the service is outstanding. Every spacious stateroom is a suite and has a designated butler and all the amenities expected from this luxury line. The ship's eight dining venues include 28 varieties of culinary delights, so multiple selections are available at every meal. In addition, the indoor and outdoor common areas are fashionable and relaxing, with interesting decor and artwork. Finally, the Silver Muse sails worldwide itineraries to fascinating destinations where its guests can interact and hear about different cultures, make life-long memories, and learn more about the world around them ​while staying in the ship's luxury environment. All 286 suites on the Silver Muse have butler service; twin or queen-sized bed configuration; bed-side USB ports for charging electronic devices; a refrigerator and bar setup stocked with guest preferences; premium bath amenities; fine bed linens and down duvet covers; a choice of pillow types; bathrobes and slippers; personalized stationery; binoculars; umbrella; daily newspaper; large flat screen television with interactive media library; twice daily suite service; and at least one hour complimentary WiFi internet access each day per guest. Of the 286 suites onboard, the Silver Muse has 230 suites classified as Classic Veranda, Superior Veranda, or Deluxe Veranda. The three types of veranda suites are identical in size, configuration, and amenities, but the price differs based on location. Each veranda suite has 387 square feet, including a 64 square foot veranda. Veranda Suites are located on decks 5, 6, 7, and 8. Travelers will appreciate the spacious walk-in closet, marble bath with separate tub and shower, sitting area, two television systems, and the butler and room service. Each Veranda Suite guest receives one-hour of free Wi-Fi service each day. Six Veranda Suites connect to the Royal or Grand Suites, making them two-bedroom accommodations for families. The Silver Muse has six Vista Suites on deck 4. Three of the suites are wheelchair accessible. These 240-square foot suites have a large window and sitting area but do not have a veranda. They have a shower with a seat, but no bathtub. The rest of the amenities are the same as seen in other suite categories. The Silver Muse has six Panorama Suites on deck 9. These suites measure 334 square feet but have a large picture window instead of a veranda. Since two of the Panorama Suites connect to a Silver Suite and the other four of the Panorama Suites connect to an Owner's Suite, families can book both suites for a two-bedroom accommodation. In addition to the standard suites, the Silver Muse has four different categories of larger suites. Each provides all the amenities found in the standard suites, but also include large sitting area with a dining table and chairs, separate bedroom with dressing table, large walk-in closet, bathroom with double sinks, separate tub and shower, powder room, espresso machine, two 55-inch television systems (smaller suites have 42-inch), and Bose Sound Touch 30 with Bluetooth connectivity. All of these larger suites also include unlimited WiFi. The 34 Silver Suites on decks 9, 10, and 11 are a favorite of many Silversea guests since they provide a luxurious apartment-like space, but are not as costly as the other three large suite categories. A one-bedroom Silver Suite measures a spacious 786-square-feet and expands to 1119-square-feet when families combine it with an adjoining Panorama Suite. The layout of the Silver Suites is similar to that found on the Silver Spirit. The two Royal Suites on the Silver Muse are found forward on deck 7. These suites measure 1130-square-feet but expand to 1528-square-feet when combined with an adjoining Veranda Suite. The forward views from these suites are spectacular, and the large living room/dining room and private veranda provide exceptional space for entertaining new or old friends and family. The authentic Italian furnishings reflect the Silversea heritage. The four Grand Suites on the Silver Muse are found forward on deck 8 and 9. Like the Royal Suites, this category has the same amazing forward sea views as those seen from the navigation bridge. The Grand Suites are similar in configuration to the Royal Suites, but are larger, measuring 1475-1572 square feet or 1873-1970 square feet when combined with an adjoining Veranda Suite. The two verandas that wrap around the outside of these suites are about 500 square feet and huge. The Grand Suites have all the amenities of the Royal Suites but feature a king-sized bed that can be made up as two twin beds rather than a queen-sized. In addition, guests staying in the Grand Suites can enjoy a complimentary dinner at La Dame. The four Owner's Suites on the Silver Muse are located in a prime location—mid-ship on deck 9 near the Panorama Lounge, spiral staircase, and aft elevators. The one-bedroom Owner's Suites range in size from 1281-1389 square feet with a 129-square-foot balcony or can be combined with an adjoining Panorama Suite, which adds an additional 334 square feet. Like the Grand Suites, these feature a king-sized bed and the finest in Italian ambiance and furnishings. The Silver Muse has eight different dining venues. Three of these—Atlantide, Indochine, and Spaccanapoli—are complimentary and have open seating for dinner. Three others—La Terrazza, Silver Note, and Hot Rocks Grill—are complimentary, with reservations necessary. The other two restaurants—La Dame and Kaiseki—require reservations and carry an extra surcharge. Silversea ships have complimentary drinks all day and night, with about 60 different complimentary wines available on each cruise. About 500 bottles of wine, 500 bottles of beer, and 80 bottles of champagne are consumed each day on the Silver Muse. In addition, 800 cans of soda, 100 Spirits, and 1100 cups of coffee are served. The bartenders quickly learn each guest's preferences, and they offer interesting cocktails and martinis in addition to the standard beer, wine, and mixed drinks. In addition to the eight restaurants onboard, the Art Cafe on deck 8 aft serves complimentary light snacks and specialty coffees/teas from 6:30 a.m. until 9 p.m. each day. People gather to eat a late (or early) breakfast and work the daily Sudoku, crossword puzzle, or trivia questions. They also gather for afternoon tea, sandwiches, scones, and snacks. The seating is very comfortable, with space indoors and out. Guests can also order complimentary 24-hour room service from the menu in their suites. Let's take a look at the complimentary restaurants in more detail. Atlantide is the largest dining venue on the Silver Muse. Located aft on deck 4, its cuisine and variety of tastes is similar to The Restaurant on other Silversea ships. Seafood and steaks are the most popular items, but Atlantide has a huge menu, so it's fun to sample the variety of appetizers, main courses, and desserts by dining at Atlantide on different nights. Atlantide also features complimentary breakfast and lunch ordered from a menu. Indochine is the Silver Muse's Asian restaurant, with dishes from India, Japan, Thailand, Vietnam, and China on the dinner menu. It is located next to Atlantide on deck 4 aft. Appetizers like beef tataki, Saku tuna, and foie gras with Asian spices will make your mouth water. The soups and noodle bowls (pho and tom yum goong) are delightful; the lobster, crab legs, and red snapper feature tasty flavors; and the short ribs, Osso Bucco, beef, and chicken complete the main menu. Dessert lovers will enjoy the rice pudding and other delicacies. Cruise travelers expect an Italian-owned luxury cruise line to have a memorable Italian restaurant, and La Terrazza on the Silver Muse continues as the cruise line's hallmark Italian dining experience. Like the other venues, La Terrazza has a large menu, and the appetizers, plates of pasta, main courses and desserts are all delicious. Many guests start with antipasti like a salad or carpaccio, followed by one of the homemade pasta or soups, and then finish with a beef, veal, or fish dish. Of course, one has to save room for tiramisu or gelato! La Terrazza has indoor and outdoor dining and is open as a buffet for breakfast and lunch. The Grill is located outdoors by the swimming pool on deck 10 and is open for casual lunch and dinner. Lunch includes hamburgers, hot dogs, sandwiches, salads, and a daily special. Since The Grill stays open longer for lunch, it's a perfect choice for those looking for a late bite after a shore excursion or free time ashore. Dinner at The Grill is a favorite of many who love their steak cooked "just right". Since the steaks, seafood, and vegetables are served on a hot rock, guests cook their own, so it should come out perfectly. A selection of side dishes and sauces accompany the grilled food. The steaks are yummy, but the salmon and prawns are also fun to cook. Veggie lovers have a selection of vegetables to choose from, and many foodies agree they taste so much better grilled than steamed. In addition to a fine Italian restaurant like La Terrazza, it's appropriate for an Italian cruise ship to have an excellent pizzeria, and the Silver Muse has Spaccanapoli, a casual eatery outdoors on deck 11 overlooking the pool. The large selection of pizza toppings will make it difficult to decide, but guests can always go back for a snack, lunch, or dinner since the restaurant is open from 11 am to 11 pm each day. The thin crust, crispy pizza tastes just like those you find in Naples. In addition, Spaccanapoli serves a selection of about a dozen gelati, frozen yogurts, and sorbets. These treats can be ordered at the table or take-away. Located next to La Terraza on deck 7, Silver Note is the cruise ship's supper club, with small plates and tapas on the menu. The dinner experience includes a jazz and blues singer and the sometimes even a little dancing. Two specialty restaurants on the Silver Muse have an extra surcharge and require a reservation. These intimate venues offer a memorable meal and exquisite presentation. They are perfect for celebrating a special event like a birthday or anniversary. Both of these venues are tiny, so reservations should be booked before boarding if you want to dine on a select date. La Dame is the specialty French restaurant on the Silver Muse and has a bespoke dinner menu developed by top chefs from the Relais & Châteaux team. As expected, the menu is filled with rich French food featuring interesting sauces and combinations. Kaiseki is the Japanese restaurant on the Silver Muse. Guests can enjoy complimentary sushi at the sushi bar for lunch, and dinner features a teppanyaki grill and sushi. The dinner menu is expansive and memorable. The interior common areas of the Silver Muse are elegant and subdued, with splashes of bright color in the artwork and accessories. The soft grays and beiges give the cruise ship a quiet, restful ambiance, perfect for a luxury cruise ship. The Silver Muse has ten lounges spread around the ship. The Panorama Lounge and Arts Cafe deliver great indoor and outdoor seating and aft sea views. Dolce Vita is the main lounge and occupies a large space on deck 5. It has a bar, comfortable seating, and is the home of the Shore Excursion, Future Cruise Planning, and Reception Desks. Panorama and Dolce Vita usually feature live music before and after dinner. Tor's Observation Library and Lounge is forward on deck 11 and provides the same great views as the navigation bridge directly below it. This lounge is usually quiet and is a good place to read and watch the scenery. Tor's is named for Torstein Hagen, the founder, chairman, and CEO of Viking Cruises. Mr. Hagen is a good friend of Manfredi Lefebvre d'Ovidio, the Executive Chairman of Silversea Cruises. Mr. Hagen named the Italian steakhouse restaurant on the Viking Cruises' ocean ships Manfredi's because of the counsel Mr. Lefebvre had provided during the construction and launch of Viking's ocean ships. To reciprocate and celebrate their friendship, Mr. Lefebvre named the observation library "Tor's". The Venetian Lounge is the main show lounge on the Silver Muse. It has a cabaret feel and features nightly performances by the Silversea singers and dancers or guest performers who come onto the ship for a few days. The Venetian Lounge is also used for lectures on a variety of topics including destinations, history, or the arts, and the lounge has a wide screen for showing movies. Connoisseur's Corner is the ship's smoking lounge, with fine cigars, cognac, and rich leather sofas and furnishings. It is located next to the Arts Cafe, aft on deck 8. The spa, beauty, and fitness facilities on the Silver Muse are located on deck 6 aft. Like many cruise ship spas, the Zagara Spa is operated by Steiner Leisure and offers many different types of facials, massages, and other wellness activities. The spa has nine treatment rooms, floor-to-ceiling windows, an acupuncture suite, relaxation area, and a dedicated outdoor whirlpool. The beauty salon and barber shop offer a full range of haircuts, styles, and colors. In addition, men can get a shave and a haircut, and the nail technician offers several different types of manicures and pedicures. The fitness center has many different types of exercise equipment. It almost makes exercise fun when you have nice sea views! Personal trainers are available for one-on-one training sessions in the gym, and exercise classes are held each day in the fitness center. The boutique shops sell a variety of clothing, jewelry, watches, and essential toiletries in the onboard shops. The ship also has an Italian cobbler from Preludio of Capri who will make custom sandals for the guests. Many guests often ask what was the most expensive item ever sold in the onboard boutiques. According to Silversea, it was a $190,000 Hubert diamond bracelet. Swiss watches are also a popular purchase on the Silver Muse. The Casino on deck 7 of the Silver Muse is small but has slot machines, poker, roulette, and blackjack games. Silversea reports that the "average" gambler on their ships spends about $50-$100 per day. This small ship also has spacious outdoor deck areas. Even travelers on luxury cruises expect plenty of lounges, chairs, and outdoor deck space for sunning or relaxing. You won't find an aqua park or water slides since this ship is quieter and more adult-oriented (although it does have a children's room and outdoor play area on deck 9). The swimming pool and two whirlpools are located mid-ship on deck 10. A third, out-of-the-way whirlpool is found aft on deck 10. Very comfortable lounge chairs are found outdoors throughout the ship, especially on decks 8-11 aft, as are padded chairs perfect for reading or socializing. The pool and bar staff circulate the outdoor area, offering cold towels or icy drinks. The ship has a dedicated walking/jogging track on deck 11 aft, and a partial promenade encircles part of deck 5. 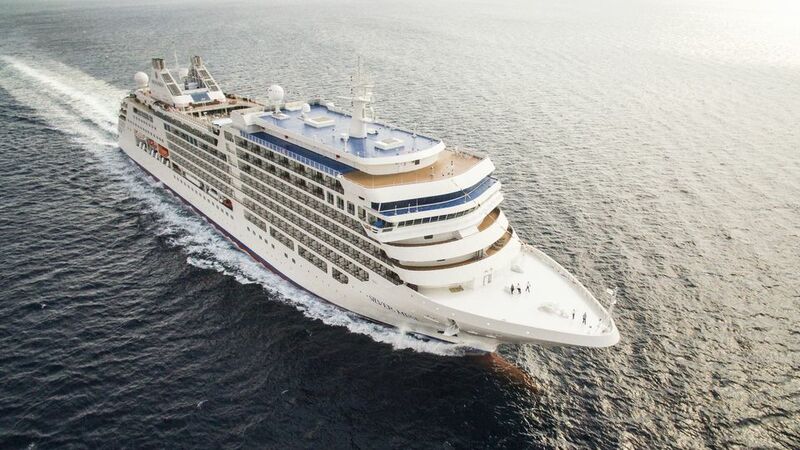 Overall, this new cruise ship is a great addition to the Silversea fleet and the luxury cruise market. The ship sails to all seven continents and many guests combine multiple segments for an extended superb cruise experience since each segment is different. The Silver Muse is beautiful inside and out and ready to carry Silversea guests to destinations all over the world in the years to come. Just as importantly, the staff is exceptional and ready to provide the high level of service that guests expect from Silversea Cruises.